Can you help me find the exact model. I keep finding The jewel mantle but it is not that. I recently bought a clock at a local auction. I knew nothing about the clock when I bought it other than I liked it. I did a little research via the internet and found out it may be worth more than the $75.00 I paid. Is it possible this clock is a reproduction? I could not find a similar clock on-line to compare it. I believe the number "441" on the backside of the clock is a serial number or maybe a model number. On the face of the clock on the roman numeral twelve, the words "Le Coultre" are present and also on the numeral six the word "Swiss" is present. On the back, the words "Le Coultre Co", "Swiss" and "441" are engraved. The clock works and keeps accurate time. It appears to be in new condition. 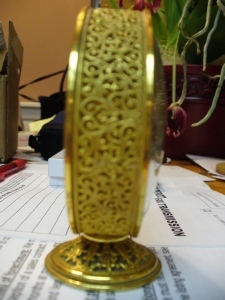 The clock is approximately 3 1/4" in diameter with a 1 1/2" pedestal. 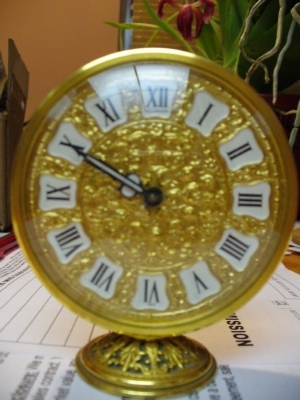 I believe the clock is made of brass and is very decorative. I have been told it is quite valuable. 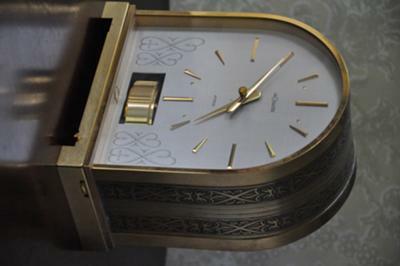 It is a Clock around 9"tall and 6" deep glass case around it and looks to be brass.It says LeCoultre Co. Swiss Made, 15 Jewel LXJ, Atmos. It works and is in pretty good condition,it weighs probally 5-8Lbs, and has a round pendulum. The serial number is #13850 and all the ones on ebay selling for $600 to $1k is in the 300,000 serial numbers. I have looked on ebay and can not find the LXJ but have found others. I was told by a few people in the clock field it was valued around $6000 can you tell me anything about this and if it worth selling.